AUSTIN, TX—The developer agreed to pay $10 for each additional square foot to the affordable housing trust fund to make the project compliant with a two-star rating from Austin Energy. Aspen Heights’ project was granted entitlements for an extra eight stories. 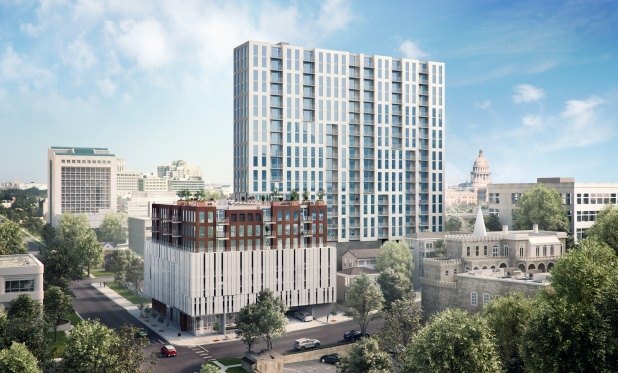 AUSTIN, TX—The tower at 805 Nueces St. made headlines for being the first project to navigate the downtown density bonus program. The 22-story project is eight stories and 86,000 square feet larger than what it otherwise would have been, based on underlying zoning. That’s because the developer agreed to pay $868,400 or $10 for each additional square foot, to the affordable housing trust fund, along with other costly building upgrades that make the project compliant with a two-star rating from Austin Energy. It was granted the entitlements it needed to add those extra eight stories in December 2014, and will make the payment to the affordable housing trust fund this fall in advance of receiving its certificate of occupancy. The project, appropriately named Rise–8th and Nueces, just topped out. Developer Aspen Heights is moving forward on this endeavor on its home turf and will start marketing for future residents in May. Construction is anticipated to wrap up by year’s end. Rise–8th & Nueces will feature 198 apartment units as well as live-work spaces on the ground floor. Other project features include a rooftop infinity-edge pool, deck, lounge, a rooftop dog park and a top-floor fitness center overlooking the state capitol building. Aspen Heights worked with local firm Greenstar Development to source the land, fund the project and assist with the development. The project’s architect, Rhode:Partners, worked closely with city staff to also ensure the project meets guidelines established by the urban design commission. That’s the same architect behind Aspen Heights’ most high-profile project to date, The Independent, a cantilever-designed condo project that broke ground earlier this year and will soon become the tallest structure in downtown Austin. Henry notes that Rise was initially proposed by others as a 12-story, 72-unit condominium complex, meaning the location will supply an additional 124 units in a part of downtown desperately in need of the supply.